As our digital world becomes more prominent, and even starts to affect our offline lives, it is becoming increasingly desirable to show your ability to network, share and influence your contacts and ‘followers’ online. A ‘Social CV’ is a new concept (to me anyway) which allows an individual to provide a visual representation of their online presence. Similar to a traditional CV, a social CV allows a potential employer or business partner to understand your ability to market yourself, your products and/or services and to engage and retain a ‘following’. Online influence is an important factor when marketing your personal brand. 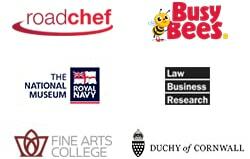 The ability to attract, interact and ultimately influence an online audience is a skill that is becoming very desirable to many marketing companies, indeed, companies such as Klout and PeerIndex have formed purely to measure and ‘cash in’ on the ability to connect influential people with businesses wishing to utilise their skills in marketing campaigns. Those with high scores and therefore influence online (according to that particular websites score) in particular areas may be chosen by a business in a similar space to receive an invite to a launch event or a gift. This is in the hope that they will then write about, and share their experiences regarding the event or gift. So as you can see, being seen to be influential online can bring offline benefits and perks as well as assist or even dictate your career path and success, but how do you demonstrate this to someone without physically going through your various social networks or showing them a single ‘social score’? There are many ways in which you can display your social prowess. As is the way with the online world, most social CV’s are very visual and not the traditional documented career history and experiences. Social media is, in essence, a very creative medium – as such, a social media CV should display all the relevant information in a creative and engaging way. With users of social media becoming more demanding, having less time to read updates and being increasingly bombarded with advertising, a social CV should convey information in short, easy to digest ‘snippets’ of information. 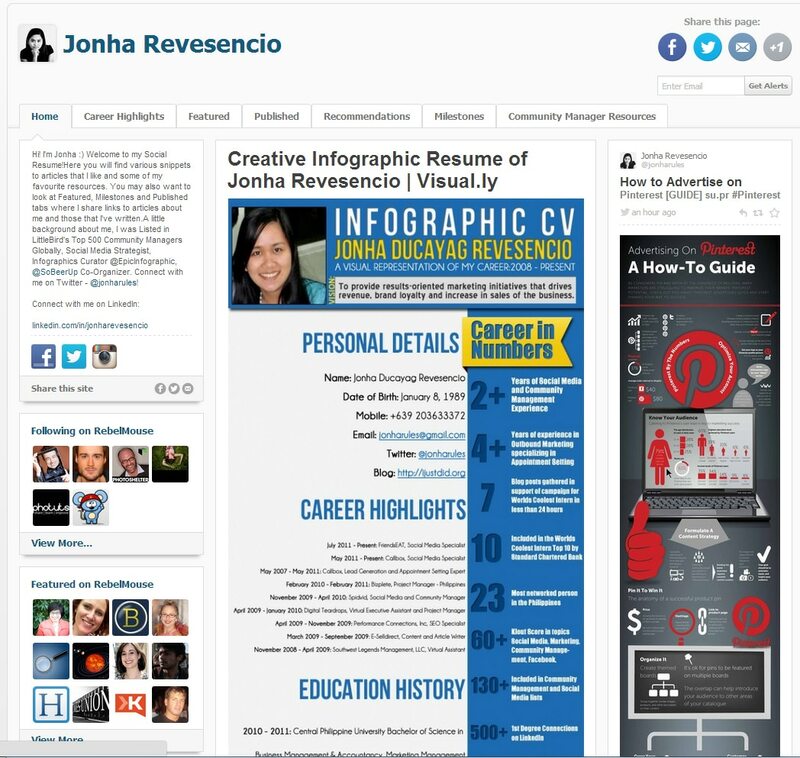 Jonha Revesencio created a social CV on Rebel Mouse, a magazine style website. Including all the relevant information visually makes for an engaging read, which is the aim. She did this using tag clouds, infographics and snippets of experiences and projects. Video CV’s are also becoming popular. Vine, a new video app created by Twitter that allows users to upload videos of 6 seconds or less, has been used as a visual CV. Dawn Siff, who took the video CV to the extreme and created the first 6 second CV on Vine actually landed a job as a result. Most social networks will allow you to add tabs onto your profile page. These areas can be used to construct your social CV. Including which networks you are involved in, your online projects, online experiences and achievements are all important. Don’t forget to include links to all relevant URLs or examples. There are countless creative ways in which to market yourself and show your impact online. If you have any other suggestions regarding social CV’s, let us know in the comments. As more business are moving away from the traditional recruitment process, social CV’s will begin to play a bigger part in our career development. Businesses are increasingly turning to social media as a medium to recruit directly or direct traffic to their online recruitment portals. Investment is growing in the business world as social media campaigns become more common place. As well as utilising this medium, many companies are looking for those candidates that partake, utilise and are successful in the social world.